"The story of the future is written in the past. "-Lord Acton, 1877. Did you know Greek philosopher Plato predicted democracy would degenerate into anarchy once people lost their virtue, then a tyrant would arise? Did you know POWER inevitably concentrates into the hands of ONE person? What was the first nation in recorded history that attempted to rule itself without a king? (Hint: they left from Egypt around c.1400 BC). 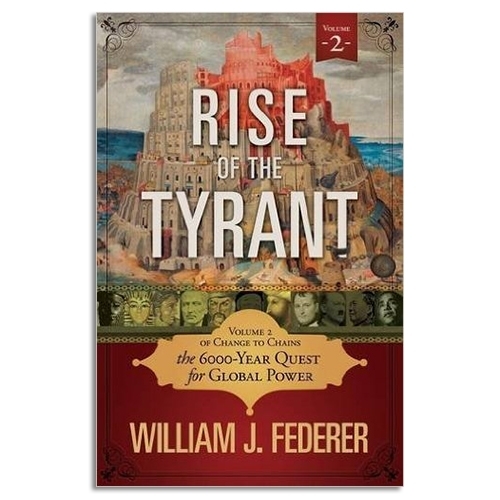 How do democracies and republics get taken over by tyrants? Learn predictive insights from Ancient Israel, Athenian Democracy, Roman Republic, Machiavelli, Hegel, Marx and Saul Alinsky. The rare experiments in self-government only worked as long as citizens had virtue. When virtue is gone, chaos ensues, followed by a call for a strong leader to restore order - but he yields to the temptation to become a tyrant. Read how Caesar "fundamentally changed" Rome's Republic into a dictatorship? George Washington warned in his Farewell Address, 1796: "Disorders and miseries ... incline the minds of men to seek security ... in the absolute power of an Individual ... [who] turns this disposition to the purposes of his own elevation, on the ruins of public liberty ... and thus to create ... a real despotism." Ben Franklin observed June 2, 1787: "There is scarce a king in a hundred who would not, if he could, follow the example of Pharaoh - get first all the people's money, then all their lands, and then make them and their children servants forever ... I am apprehensive that the government of the States may, in future times, end in a monarchy." Yale President Ezra Stiles stated May 8, 1783: "Whatever mutations may arise in the United States, perhaps hereditary monarchy and a standing army will be the last." President William Henry Harrison, warned March 4, 1841: "The tendency of power to increase itself, particularly when exercised by a single individual ... would terminate in virtual monarchy." Of communist dictatorship, Vladimir Lenin said: "The goal of Socialism is Communism." Can 6,000 years of history help predict the future? 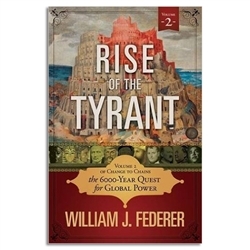 This volume is an in-depth review of the rise and fall of great republics, kings and tyrants, with profound quotes from notable philosophers, statesmen and historians, allowing the reader to gain powerful insights from the past into what is happening in the world today. An amazing overview of 6,000 years of recorded history, taking you from the Tower of Babel to a One World Global Government. By the end of this book, you will be one step closer to answering the question, "is history repeating itself?"